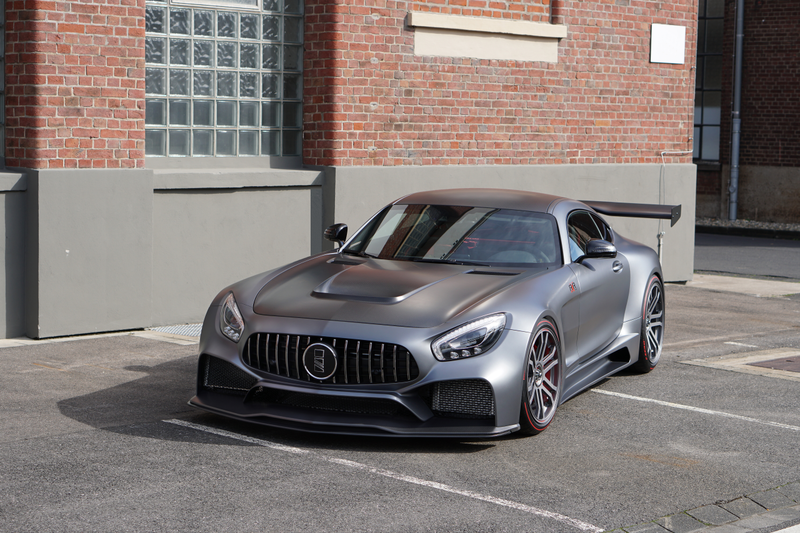 Over the years, IMSA GmbH has become synonymous with high performance and exclusivity, personalising Mercedes and Lamborghini cars to the individual requirements of clients. 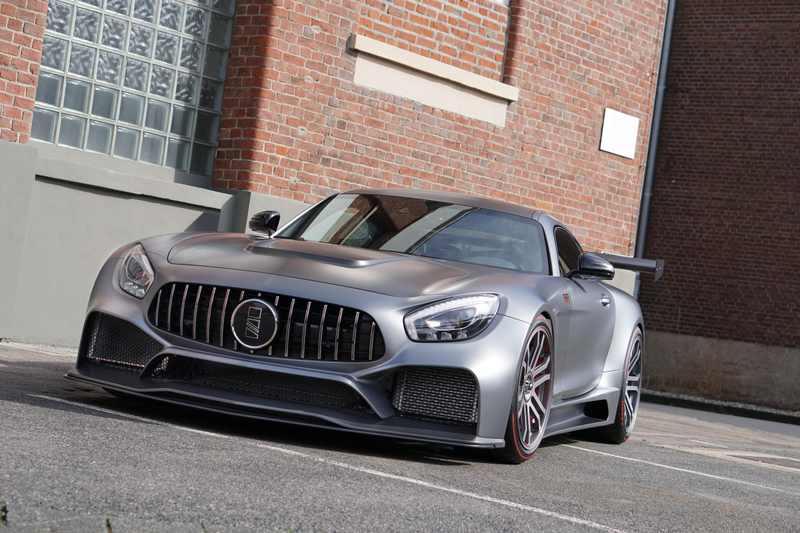 IMSA is now taking this a step further and is proud to present the limited edition RXR One Super Gran Turismo. 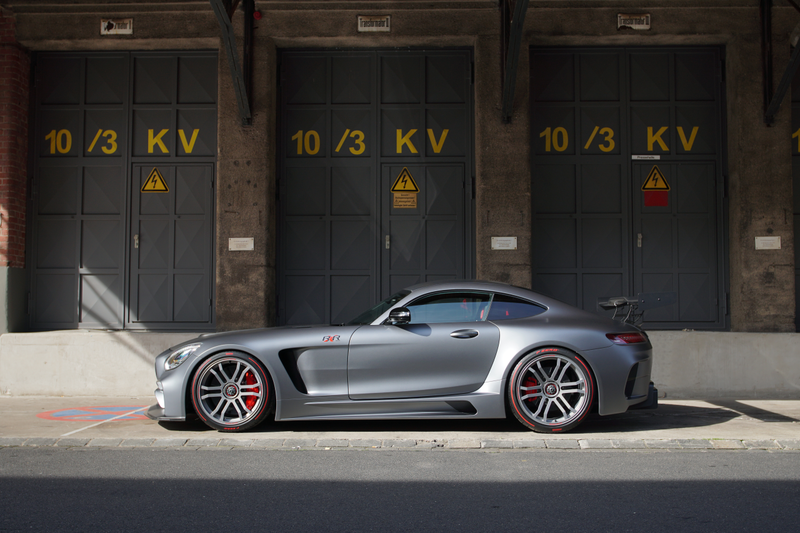 The brief for this unique car was to marry the performance of a major league mid-engine supercar with the inherent practicality of a traditional front-engine, rear-wheel-drive GT car like the AMG GTS on which the RXR One is based. 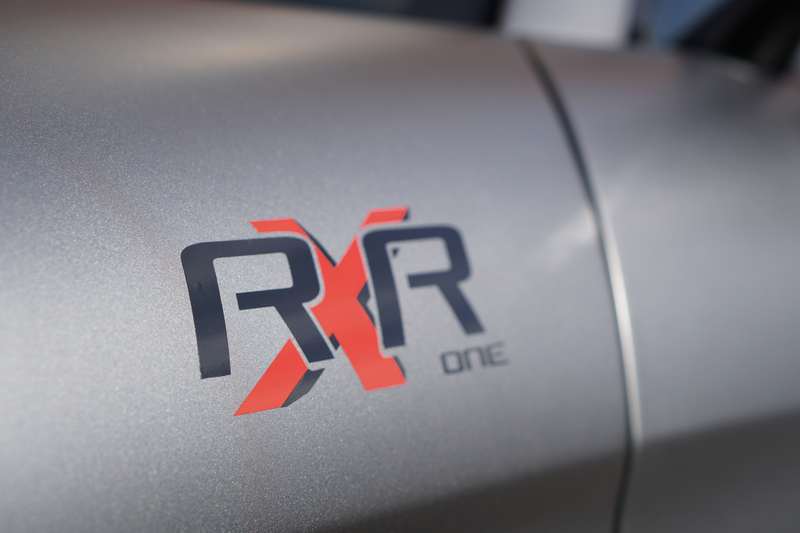 RXR stands for Road X-tra Racing. 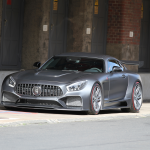 IMSA founder Holger Mohr explains that the RXR One project came out of a specific request from one of his existing Lamborghini customers who had reached a stage in his life where he needed a more practical supercar that could be used as a daily driver, but was not willing to give up the performance of his tuned Lamborghini. Having set the specification with IMSA, the owner then agreed that other like-minded people should be offered the chance to share this incredible concept, hence the limited edition idea. 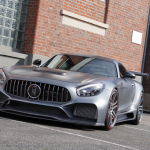 “We came to the conclusion that the AMG GTS was the best car on which to base this project since it already ticked all the boxes in terms of practical packaging, its front-mid-engine, transaxle gearbox layout, and race-style double wishbone suspension”. To reliably handle this massive output the gearbox was re-engineered using a competition grade clutch pack featuring two additional clutches, a forged intake drive shaft, high-pressure valves, and an independent oil cooling system. The rear differential also has its own oil cooler. The cooling systems for the engine, gearbox and differentials had to be redesigned and re-dimensioned due to the greatly increased engine output and the extra heat generated. So the two turbochargers now have their own independent water-cooled circuit. 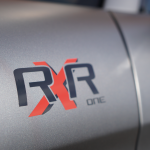 Chassis: As well as improving crash safety on the racetrack, the roll cage fitted to the RXR One significantly improves torsional stiffness, which in turn allows the suspension to work better. Occupant comfort and protection are further enhanced by the bespoke IMSA carbon-fibre sports seats, equipped with six-point safety harnesses. Perfecting the chassis dynamics for both road and track in a car with this level of engine power resulted in major changes being made to the basic double wishbone suspension components. 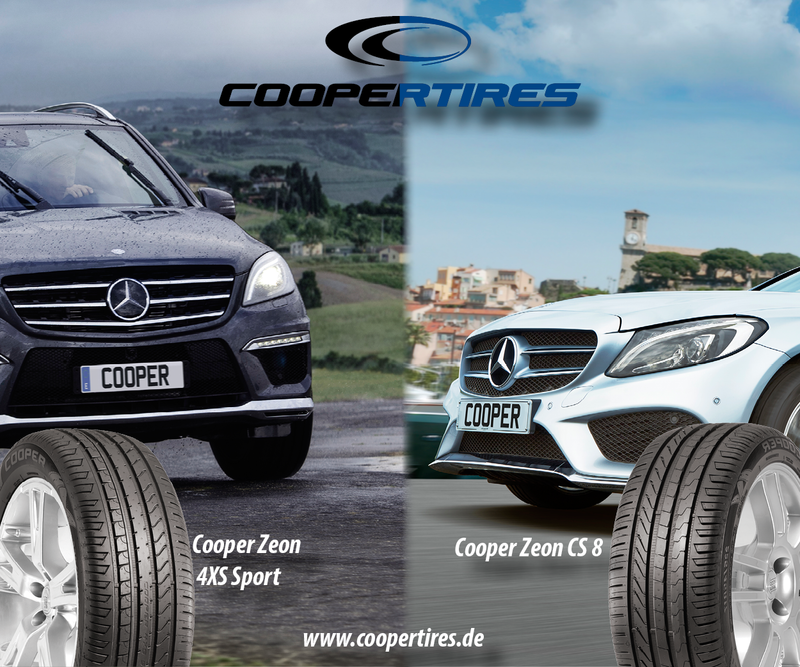 It was ascertained that the keys to taking handling and grip to the next level were widening the front and rear tracks and then optimising the geometry resulting from the lower, broader based suspension. To improve suspension kinematics, the RXR One uses bespoke forged wishbone mounts with Rose joints, revised forged wheel hubs, and of course longer, uprated driveshafts. 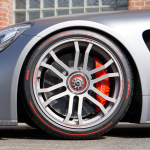 The competition springs and dampers are also unique to this car and are fully adjustable for bounce and rebound. 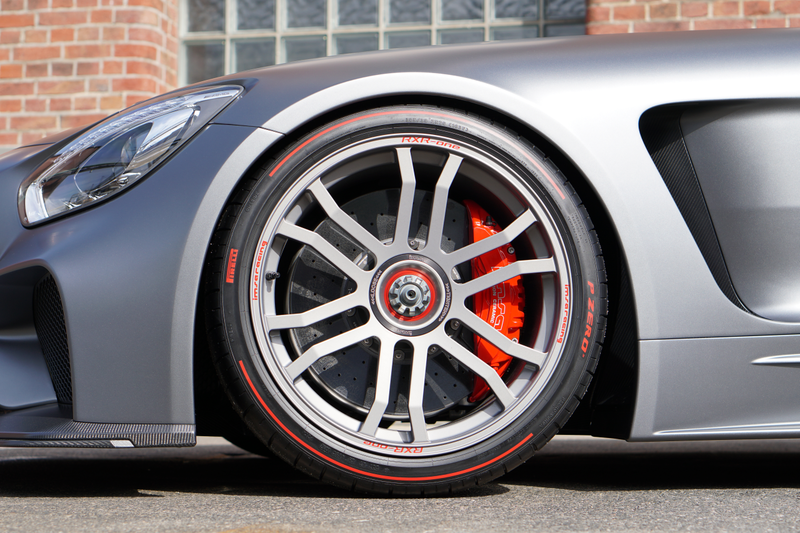 The wide performance envelope available allows the owner to dial the car in perfectly for both road and track use. 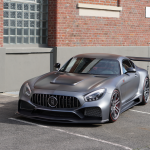 Aerodynamics: Designed with the help of a state-of-the-art industry computer programme, the autoclaved carbon-fibre bodywork of the IMSA RXR One achieves the optimum balance between drag, down force, and a purposeful appearance. 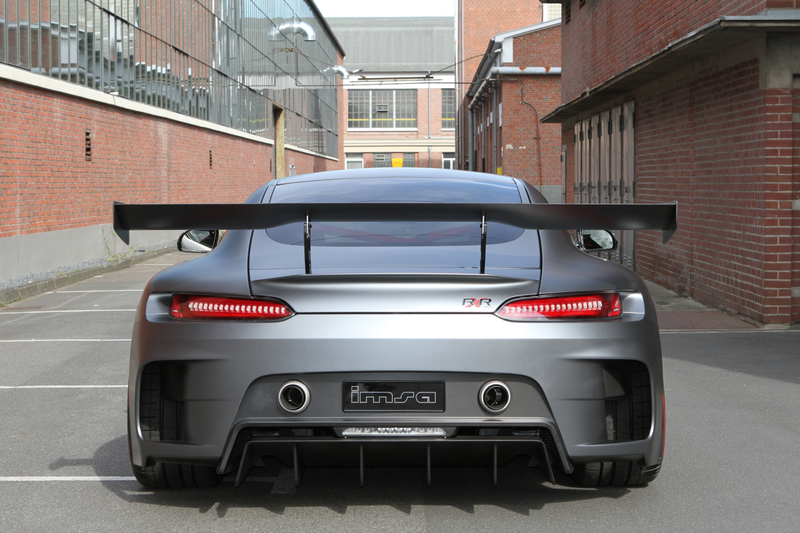 The wider tracks are covered by carbon-fibre wings that are 55mm wider per side (110mm overall) in front, and 65mm wider per side (130mm overall) at the rear. 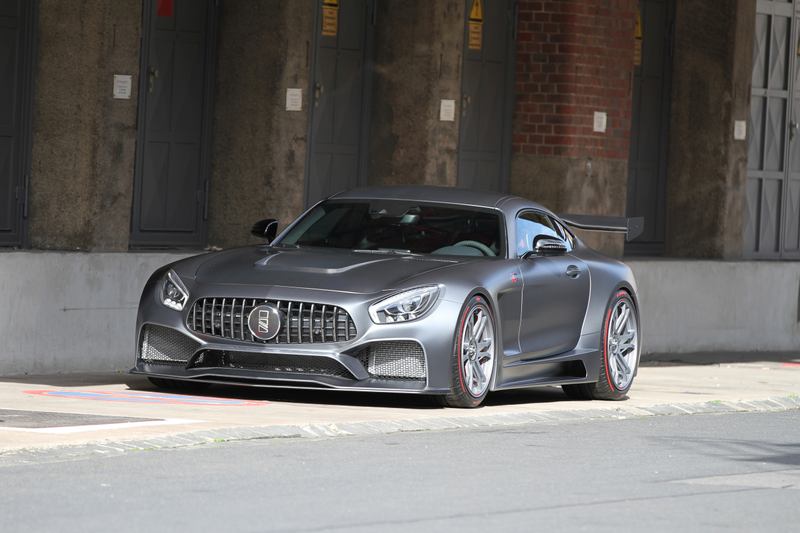 In comparison, the factory AMG GT R is 57mm wider at the rear than the GT S, but is only 15kg lighter. 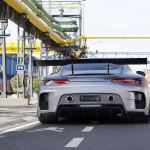 The wider arches of the RXR One are optically and functionally linked by the deep side-skirts that enhance the ground effect generated by the cars completely flat bottom. 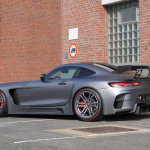 Other bespoke carbon-fibre body components are the complete front bumper/spoiler assembly. 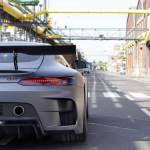 The bonnet, roof, boot-lid, and rear wing are other major components made from autoclaved carbon-fibre. 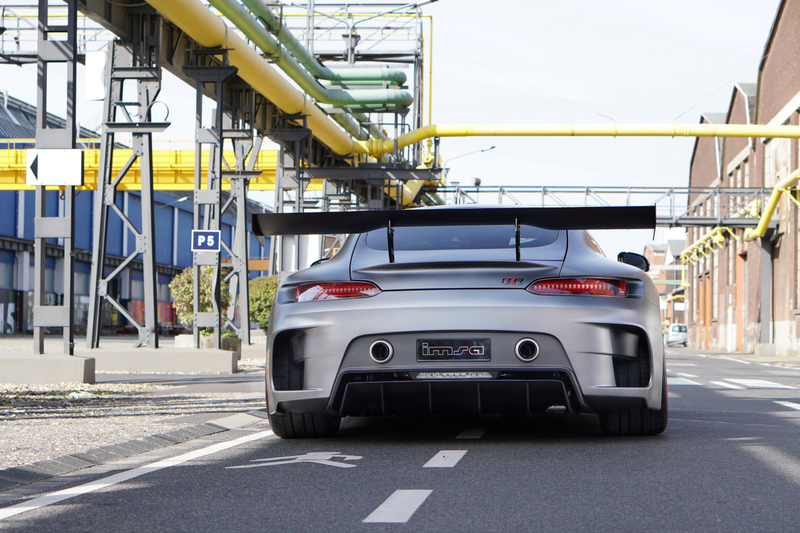 Extensive wind tunnel testing threw up some issues that could be more easily resolved on a limited production, hand-built car like this than a mass-produced OE manufacturers product. 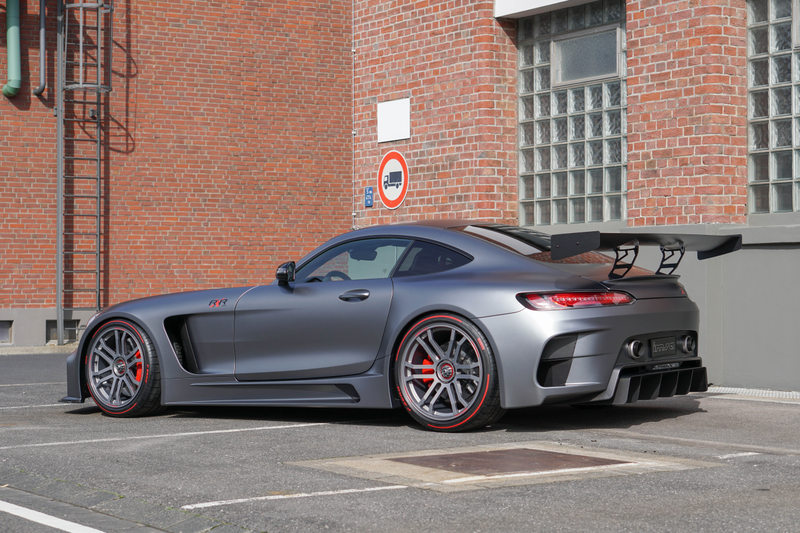 With “No Compromise!” as their company motto, IMSA has a long-standing reputation as an R&D consultant for OEMs as well as other aftermarket tuning companies. 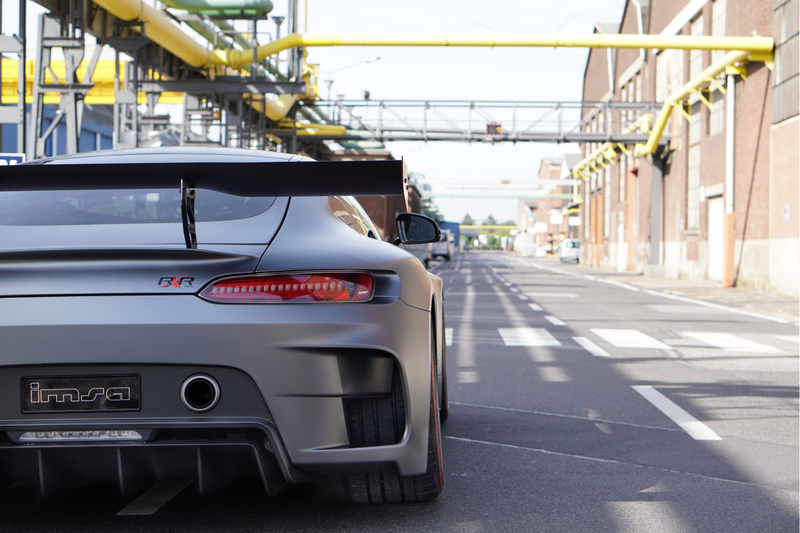 A showcase of IMSA’s comprehensive experience in design and engineering, the unique RXR One is the vanguard of a new aftermarket segment whose goal is to maximise the inherent all round potential of an already accomplished super sports car.